I love cats. I'm sure you've noticed that if you have followed my blog for any amount of time. Eureka Stamps has some great kitty images and this week I was able to use Digi23902 – Cool Cat with Shades and Digi23901 – Being Cool. Our theme at Eureka this week is "No Square Cards". Ah, I'm so bad at shaped cards. But I had this circle base already form a kit and decided to embrace the circle! 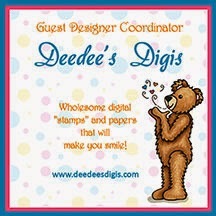 After embossing the base, I just added a ribbon and cut the image our with Nesties.....instant card! Come on over to Eureka Stamps and join the fun with us this week! LOVE this ~ great design!! !